With Mailster you can send birthday greetings to your subscribers. All you need is the birthday as a custom field. 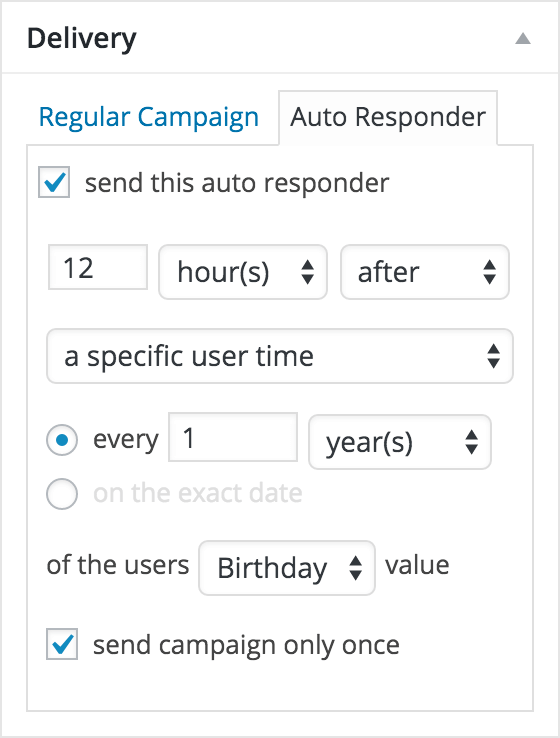 Now create your birthday campaign and switch to the Autoresponder tab in the delivery panel. Select “a specific user time” from the dropdown to reveal more settings. To specific the time you have to set it up above. Since the birthday starts on Midnight (00:00) you have to set it to “12 hour(s) after” to send it twelve hours after midnight – on midday. Save your campaign and you’re ready to go.